There are any number of methods in Jyotisha to look into future.Similarly Prasna also has many methods.If we care to understand a little,our minds are baffled at the immensity of research that was done in the past in the field of Jyotisha. Many moderns,assuming that they are more intelligent than the ancients,pose questions like-"Is it really necessary to know our future?What is the fun of knowing it when we cant do anything to alter it? ".This kind of criticism does nothing other than exposing our ignorance of the principles of a grand science.Our ancient rishis foresaw and answered these doubts thousands of years ago.They were not money minded like us.They selflessly passed down many methods to know future.Sarvathobhadra Chakra is one among them. Sarvatobhadra Chakra appears as an effort to integrate Jataka,Gochara.Prashna and Muhurta all rolled into one synthetic whole encompassing vowels,consonants,tithis,days,stars,rasis and planets. One can analyse Jataka,prashna,gochara and set muhurtha using this wonderful tool. 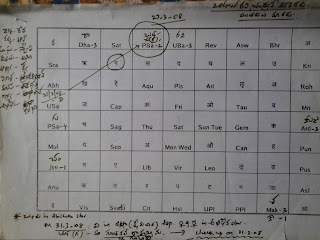 In 2008, I used this method to foresee my promotion and transfer.Not only that I could guess which town I was going to be posted.The chart which I drew and analysed on 27-3-2008 is shown above.The analysis on that paper is in Telugu which is my mother tongue and at some places in English. When yogakaraka planets transit over Abhisheka star, one receives honors. My lagna is Makara and Venus and Mercury are my lucky planets.They were already in Abhisheka star.On 31-3-2008 Moon was going to transit in my Kshema star and aspecting Venus-Mercury combination. This aspect is passing through the syllable "ga".My likely places of transfer were Hyderabad,Secunderabad, Vijayawada, Guntur,Nanded and Guntakal.At that time I was living in Guntur.So the other town starting with the letter 'ga' is Guntakal. So I predicted on 27-3-2008 that I would receive my promotion and transfer orders to Guntakal town on 31-3-2008. Exactly on 31-3-2008 I got my orders to Guntakal as expected. This is an example to show how Sarvatobhadra Chakra could be used to peep into future.